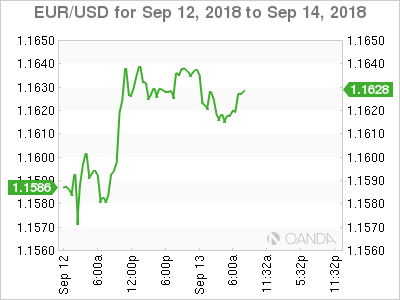 EUR/USD has edged lower in the Thursday session. Currently, the pair is trading at 1.1620, down 0.05% on the day. On the release front, German Final CPI dipped to 0.1%, matching the forecast. The ECB releases its main refinancing rate, which is expected to remain at 0.00%. The U.S releases key consumer inflation reports. CPI is expected to edge up to 0.3%, while Core CPI is forecast to remain pegged at 0.2%. As well, unemployment claims are expected to rise to 213 thousand. On Friday, the U.S release retail sales and UoM Consumer Sentiment. The ECB has pegged interest rates at 0.00% since March 2016, and no change is expected at Thursday’s policy meeting. The markets will be focusing on the rate announcement and Mario Draghi’s press conference. The Bank is expected to lower its growth forecast due to weaker global growth and could spell out downside risks to growth. Inflation is expected to remain steady at 1.8% in 2018 in 2019, which means that the ECB is on track to wind up its asset-purchase program in December. Any change in monetary policy will not occur before next year, and an interest rate hike in unlikely before the second half of 2019.